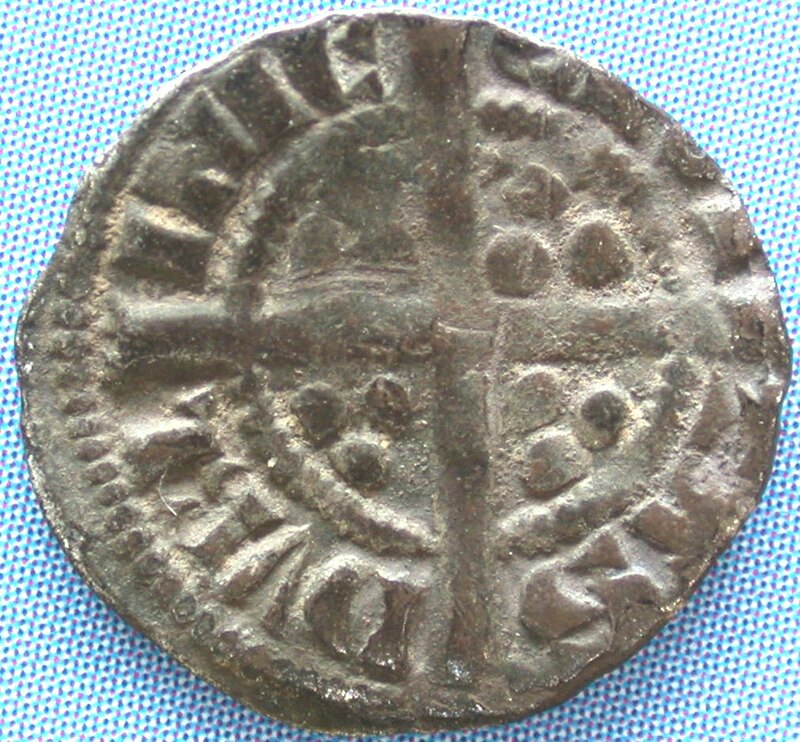 The "Early Issue" Edward I Irish farthings appear to have been struck from dies produced in London. 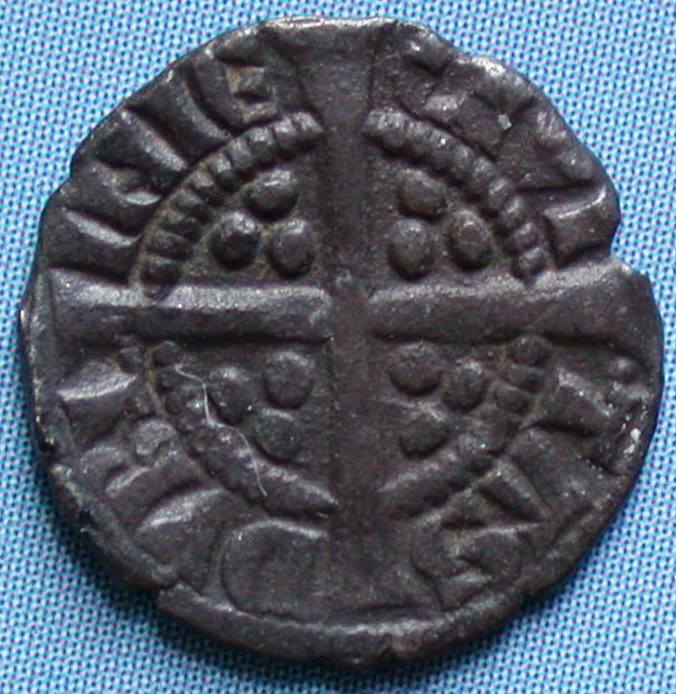 It is possible that the the "Late Issue" farthings were struck from the dies ordered for Ireland from William de Wymundham between 1292 and 1295 (ref. BNJ 46 1976, pp 46-47) although Withers puts the issue date at 1297-1302. Legend around the outside of a triangular frame which encloses the kings' head. Tall trifoliate crown. Oval face with pellet eyes and bushy hair of three strands. No neck with triangular drapery. Open C & E, composite S, large A, wedge tailed R, incurved uprights to the I's and N's. 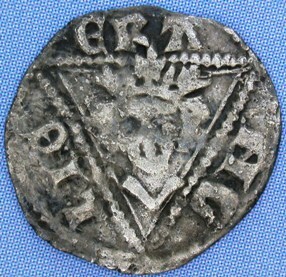 (May '05) A fine example of this coin was found by Detego Metal Detecting. 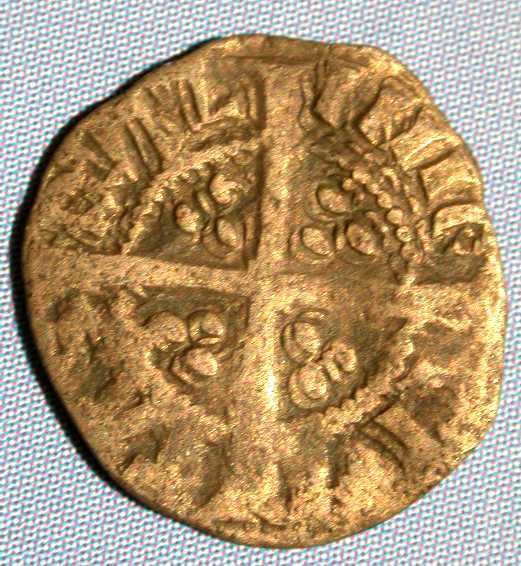 The example shown above could be Type 1b (with a triangle followed by NG on the obverse legend) or Type 1d (with ANG on the obverse legend) - the condition of the coin makes positive identification impossible. 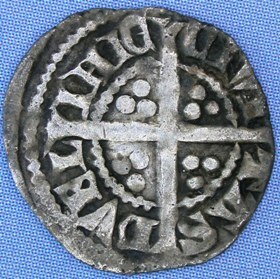 The same obverse die was used on both the examples seen. Legend around the outside of a triangular frame which encloses the kings' head. Tall trifoliate crown. Oval face with pellet eyes and bushy hair of three strands. No neck with triangular drapery. Open C & E, composite S, large A, SCROLL tailed R, incurved uprights to the I's and N's. 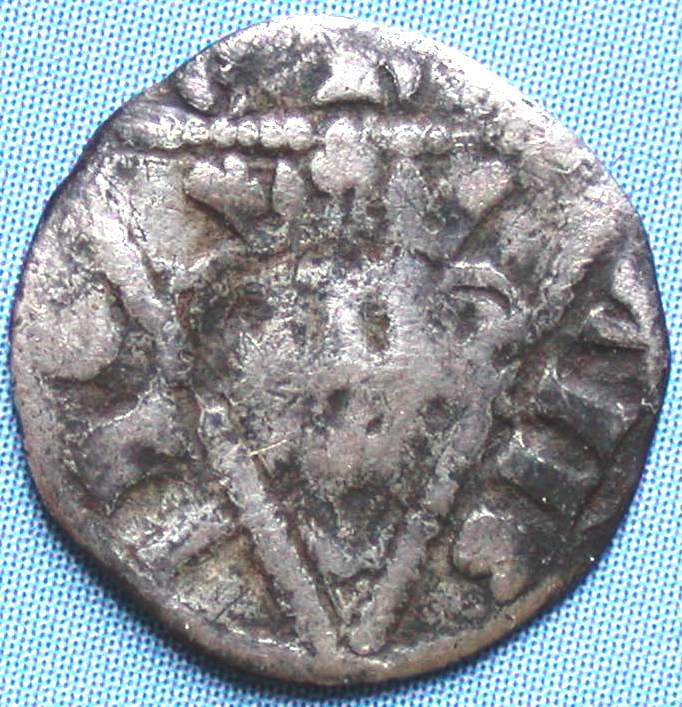 Patrick Finn noted in his May 1999 List of Coins: " The earliest of Edward's Irish farthings, a previously unrecorded variety... of greatest interest and the highest rarity. I am grateful for Jeffrey North's comments on this piece and in particular for pointing out that he had not noted the scroll-tailed R on a farthing before, it is always the wedge-tailed form." 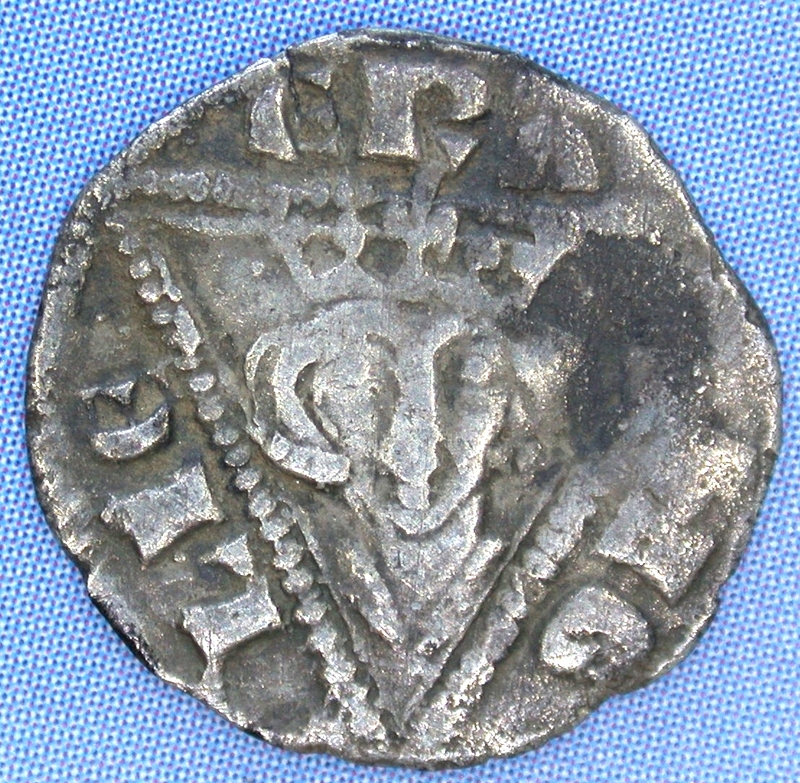 As Type 1e (above) with a SCROLL tailed R - but on the reverse there is a pellet before the T in TAS. In the Red Book of the Irish Exchequer, there is a reference to ''William de Wymundham, comptroller of the King's exchange in England, by command from the bishop of Bath and Wells, the King's treasurer, sent to Sir William de Essenden treasurer of Ireland, twenty four stamps for coining money there, viz. 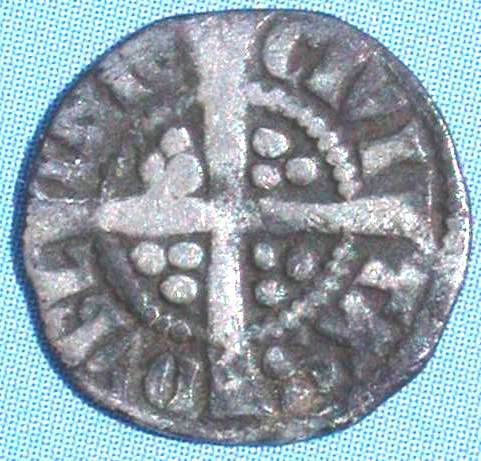 three piles with six crosses for pennies; three piles with six crosses for half-pennies, and two piles with four crosses for farthings. 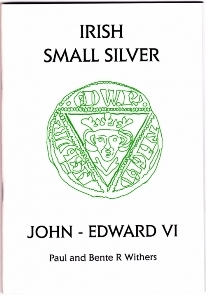 And these be sent by John le Minor, Thomas Dowle, and John de Shordich, clerks, Members of the Company of Minters at London, to be by them used in the coinage of money.' It is possible that this entry in the Red Book refers to a new Irish coinage some time between 9 June 1292 and 16 August 1295 - during the Fourth or Fifth coinage. 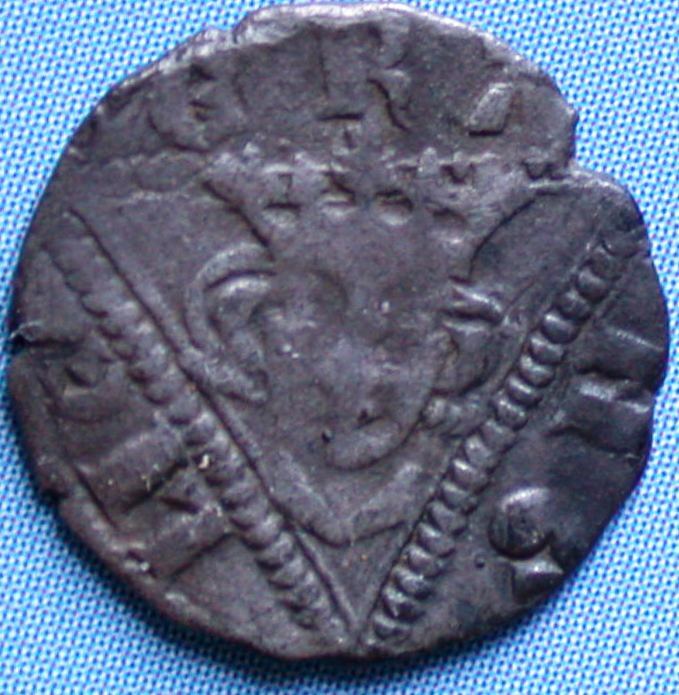 No farthings are currently known to exist from that period2. Legend around the outside of a triangular frame which encloses the kings' head. Very wide trifoliate crown. Small face with flatter string-like hair. Long neck with V-shaped drapery. Closed C & E,	continuous S, squat A, curved tailed R, straight uprights with serifs	to the I's and N's. Legend around the outside of a triangular frame which encloses the kings' head. Very wide trifoliate crown as Type 2. Small face with flatter string-like hair. Long neck with V-shaped drapery. Closed C & E, continuous S, squat A, curved tailed R, straight uprights with serifs to the I's and N's. Pellet below bust. 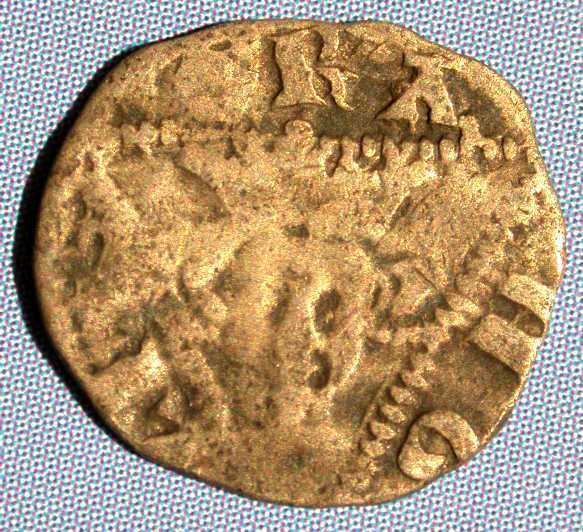 This coin was recorded in the British Numismatic Journal 46 (1976), pp.46-47, and SNC Vol. C, No. 9, (Nov. 1992), pp. 305. Irish Academy, 66, Section C, no. 3, pp. 235-97.